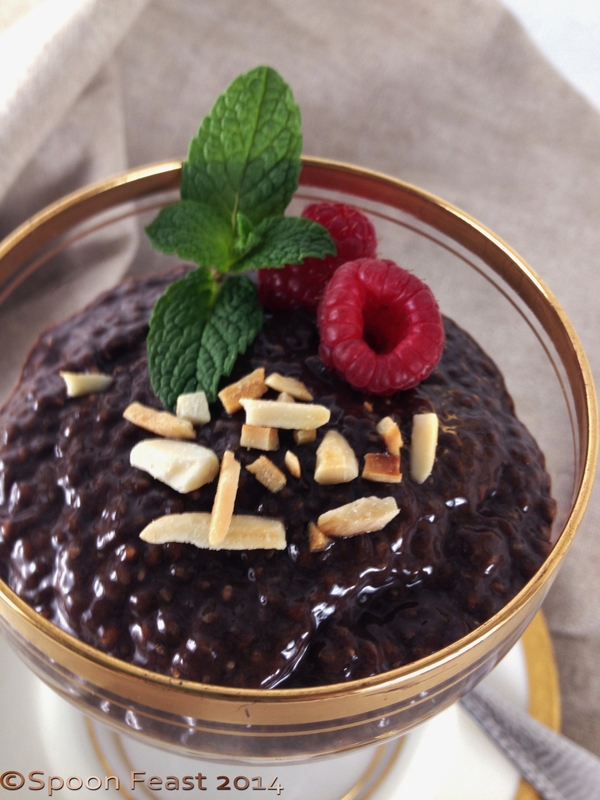 There’s been a stir lately about chia seed pudding and this recipe for Chocolate Chia Seed Pudding with Toasted Almonds is one of the best I’ve tasted. Yum, Chocolate! When I first bought the bag of chia seeds, honestly, I had no idea how I was going to use them. I kept having flashbacks of smearing the soaked, slimy seeds over a rough damp terra-cotta pot shaped into some absurd shape. In college, my roommate and I had some; mine was an animal that grew chia fur, my roommate had a head that grew chia hair. But enough of silliness, on with the recipe! Best part is the seeds aren’t sprouted for the pudding. The thing about chia seeds are they absorb quite a bit of liquid compared to their dried mass. This thickens products they are used in and results in a bit of an off-putting gelatinous substance. Hold your judgement. The chia seed has good nutritional value providing omega 3 fatty acids, protein, fiber, magnesium, potassium, calcium and zinc. It’s a powerhouse of good nutrition. Mix the dry ingredients together so there are no lumps. Mix the wet ingredients together; add a small amount of liquid to the dry ingredients. Stir this until it makes a smooth batter-like paste. Fold the rest of the liquids into the dry ingredients and mix well. Dry cocoa powder does not combine easily with the milk if you just add everything all at once. There could be lumps of dry cocoa in the finished pudding which would be kinda yucky. SO add just a bit of milk and stir it in to get the cocoa wet and lump free before adding all of the milk. Cover and set aside then stir every 20 minutes 3 times.This ensures the seeds are not clumping and will hydrate correctly. Then put the covered pudding into the fridge for at least 2 hours or overnight. To serve, fold in toasted almonds, reserving some for the top garnish. Spoon the pudding into a small bowl or cup, sprinkle with a few toasted almonds on top, add a small mint leaf and a berry or two if you have any on hand. You can use any milk you prefer, even half and half but that sort of defeats the “healthy” part of this recipe. If you choose coconut milk, read the label and make sure of the ingredients before you buy it. You can add spices like ginger, cardamom, cinnamon, use almond extract or orange or raspberry extract for flavor enhancement. Leave the nuts out, add fruit or nothing instead. I’m thinking coconut, rose-water and cardamom, or chocolate raspberry next! Since I had to taste this while writing about it, I didn’t realize I ate the majority of the dish and now have to make more to photograph the final plate up. Duh! It’s like the time I walked into the kitchen and ate the photo shoot. I dream of having a staff to help keep things straight! 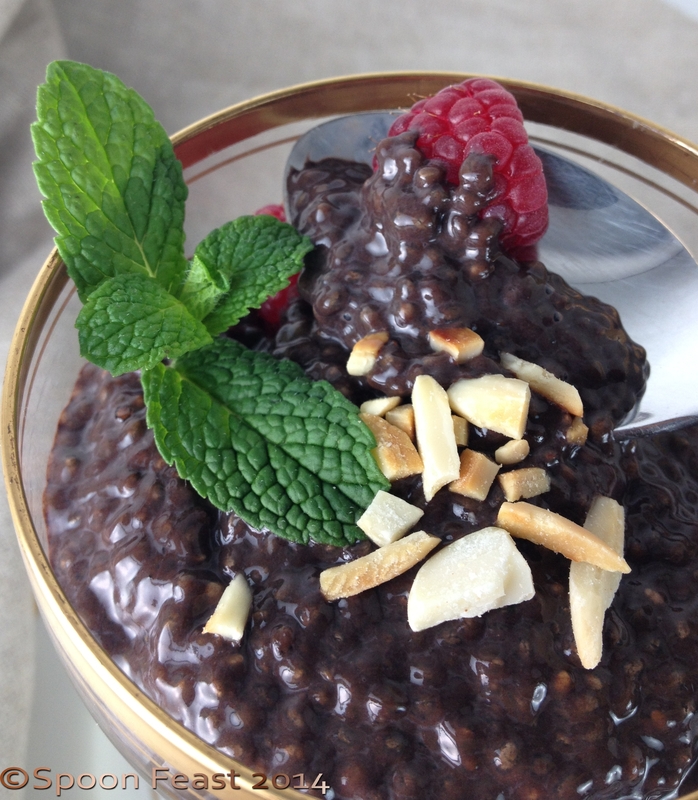 This entry was posted in Desserts, Nutrition, Recipes and tagged chia seed, chia seed pudding, chia seeds, chia. chia seeds, chocolate chia seed pudding, natural foods, Toasted Almonds. Bookmark the permalink. Hi Pam, the recipe sounds interesting and the videos were very cool. They take you back. Yeah they do! I had to giggle! Excellent….adding chocolate to ANYTHING is a great idea!